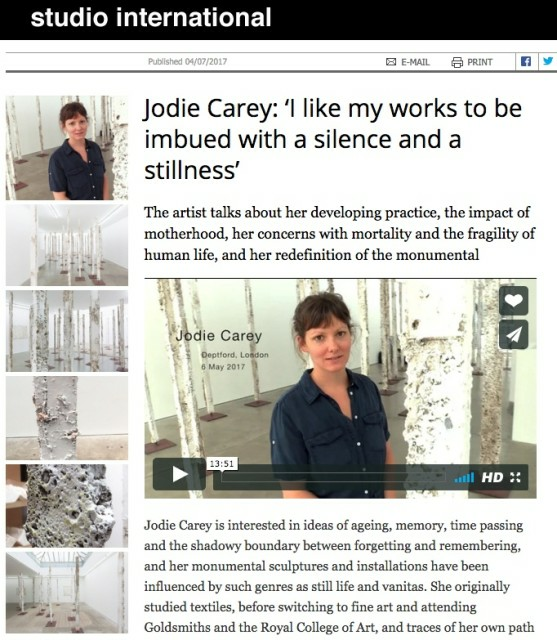 4 July 2017 The artist talks about her developing practice, the impact of motherhood, her concerns with mortality and the fragility of human life, and her redefinition of the monumental. Jodie Carey is interested in ideas of ageing, memory, time passing and the shadowy boundary between forgetting and remembering, and her monumental sculptures and installations have been influenced by such genres as still life and vanitas. She originally studied textiles, before switching to fine art and attending Goldsmiths and the Royal College of Art, and traces of her own path are evident in her painstaking and labour-intensive artworks. Since having her first baby in 2016, and returning to her studio three weeks later, she has moved away from her more decorative and ornamental earlier works and begun to strip back her work and make it more subtle. Carey, whose works develop through the process of making, describes her art not as a job but as an extension of who she is. She prefers more traditional and “simpler” processes, such as carving, weaving and drawing directly on to walls, eschewing anything heavily fabricated. She juxtaposes materials and scale, questioning the nature of the monument and exploring how something transient and fragile might also be quite monumental in its own right. Carey invited Studio International to her south London studio while she was making works for her new installation, Earthcasts, at Edel Assanti, London. Burying lengths of salvaged timber in the ground, she created rudimentary moulds, into which she then poured plaster. The resulting sculptures, which she worked into by hand, sometimes adding a lick of white paint or a shade of coloured pencil, are of a human-scale and could equally be age-worn human figures or gnarled tree trunks – again, the human and the natural is a juxtaposition Carey enjoys exploiting. There is a material roughness to her pieces, which she describes as “very physical objects”.